This entry was posted in Racing on April 27, 2013 by Steve Tilford. 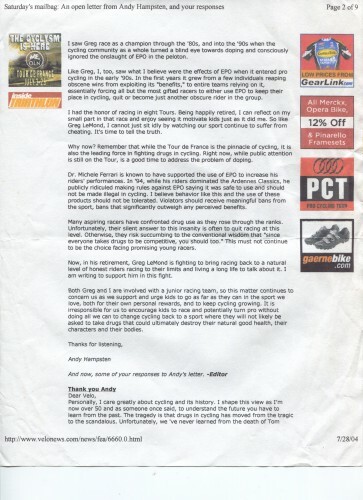 Below is a letter than my friend and ex-team mate, Andy Hampsten wrote in Velonews nearly 9 years ago. I found it last night sorting through some old paperwork. I printed the letter out back then because I thought it was a very exceptional risk and special act, defending Greg Lemond. Greg’s vocal criticism of Lance, during this time, the Lance Era, was unpopular to say the least. Andy’s support of Greg was very brave and honest. 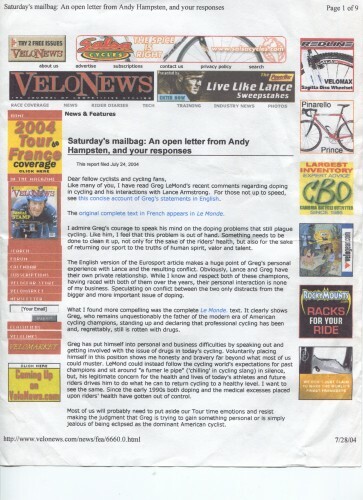 I wrote to Velonews supporting Andy’s position, thus Greg’s. But, whenever I ran into Greg, I told him that he was fighting a very unpopular and losing battle. It was a lose/lose situation for him. He understood that, but that didn’t deter him. Another brave and honest act. It is embarrassing how little we’ve progressed, in close to a decade, addressing this issue. Obviously, the actions taken by our sport haven’t been very effective in deterring the problem. Anyway, it is nearly the same old, same old. I don’t want to be able to write a web post 9 years from now that is applicable to today’s problems concerning doping in the sport. Here is the article in another format.